In early January, Mozilla UX conducted user research to refresh their understanding of how people save, share, and revisit mobile content with the goal of building a knowledge base for a larger contextual research project on multi-device task continuity that is currently being conducted. 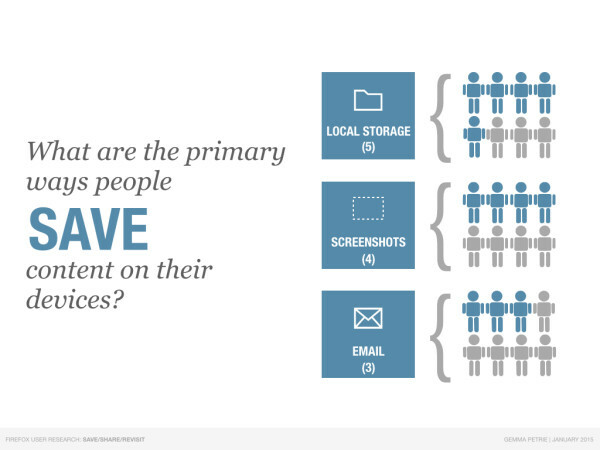 Primary findings indicate that most people are using low-tech systems to save, share, and manage their content. There is a tendency in tech circles to overestimate the popularity of services like Pocket and Evernote, when in fact the most competitive task continuity resources are basic services like email, local storage, text messages, and screenshots. Most people are aware that their personal system isn’t perfect, and in fact often cumbersome to maintain, but other solutions are perceived as some combination of absent, confusing, or limited by storage/price.